In recent issues of the Weekly Worker a controversy between Arthur Bough1, on the one side, and Bruce Wallace and Steve Dobbs2, on the other, has developed over some interesting questions. In another article, I have estimated the rate of profit on fixed capital in 14 countries, which currently account for 60% of the world economy.4 That article contains my own estimates, including an earlier version for the United Kingdom, and those of other authors. The inclusion of a rate of profit on fixed capital for the Chinese economy since 1978 is the result of a series built up by other authors (and on the same basis as the other 13 studies). However, in this article I emphasised the relevance of the rate of profit in China mainly in the last two decades, when its conversion into a capitalist country became a fundamental fact from a systemic point of view. In case there is any doubt, I consider irrelevant and improbable the existence of a rate of profit in 1978 in China. To question that research over that specific aspect is at least superficial. My work has never sought to arrive at a specific explanation for the crisis of 2008-09, nor develop a specific theory of crisis, but simply to check whether or not there is a long-term downward trend in the rate of profit and try to establish some elementary connections, including those related to the period of partial recovery in profitability that started in 1982. I understand that the results can be shocking to those who deny the tendency of the rate of profit to fall, even more when the debate itself has been practically focused on just one country, the United States, and that research tends to confirm the tendency in a highly representative group of countries. So this article is not intended to explain the current crisis, but to contribute to the debate on the tendency of the rate of profit to fall and in particular in the case of the United Kingdom. Capitalist production consists of a valorisation process (M-M’) through the exploitation of the labour force (M-C…P…-C’-M’). The capital advanced in the form of money (M) is exchanged for commodities (C) – means of production, raw materials (constant capital or CC) and labour force (variable capital or VC). The secret of capitalist production is that the labour force is able to generate more than its reproduction value: namely a surplus value. For this reason, the capital advanced for the labour force is variable capital, while capital advanced for the means of production (machinery, infrastructure) and raw materials is constant capital. Thus, the production process (P) occurs when the labour force, using the means of production, transforms inputs which are then realised in a mass of commodities of a greater value than the original money advanced (M’). The final product includes the value of constant capital consumed, plus an additional amount generated by the labour force, equal to variable capital (the reproduction value of the labour force) exchanged with the capitalist, and a surplus value. Thus capital transmutes from money-capital to commodity-capital, then productive-capital, finally returning to the form of commodity-capital and money-capital of a greater value. This last step is the one that involves the sale on the market (C’-M’): ie, the realisation of the profit and the completion of the valorisation process. There is continual pressure for each capitalist to sell at a lower price than competitors and so raise market share. This implies a constantly increasing expenditure mainly on fixed capital – equipment and infrastructure – which enables the productivity of labour to rise, or labour time necessary to produce commodities to be reduced, thus reducing the individual value, including that of the cost of reproduction of the labour force. But to do this, there will be a relative rise in the value of constant capital compared to that of variable capital (for the reproduction of the labour force). As can be seen, there is a huge (and non-casual) similarity in Marx’s arguments about the value components in commodities and the tendency of the rate of profit to fall. Both refer to the same reality from two different angles. In both cases the increase in the rate of surplus value has clear limits in offsetting the relative increase in objectified labour (constant capital) in determining both the value of commodities and the rate of profit. The capitalist advances circulating capital, as inputs and wages, but recovers this capital, not in a year, but when the commodities containing such capital are sold. So that if the capitalist buys a ton of steel in January and in March sells it after its transformation into metal tubes, by April he has already recovered the amount paid for the steel in January. So in April’s production he only reinvests the circulating capital advanced in January. Thus the value of the circulating capital is totally transferred to the final product after each production process and is recovered by the capitalist once those commodities are sold, to be newly released on production and valorised. The annual wage bill thus relates to the amount of variable capital advanced, multiplied by the annual number of turnovers performed. Indeed, the capitalist does not advance the amount of the annual wage bill, but only the variable capital, so only the latter must be included in the annual rate of profit. Since it is the labour force, using machinery, which transforms the inputs representing circulating constant capital, the turnover of variable capital is similar to that, although it can be speculated that it is somewhat lower, due to the time lag between purchase of inputs and their real availability (obviously variations and complexities in this regard in reality are huge). Fixed constant capital turnover takes several years, transferring to the product only a minor portion of its value in a year. In national accounts this transfer appears as the depreciation or consumption of fixed capital. The picture that Bough sought to generate without any basis is that the increase in the turnover speed of circulating capital can keep the annual rate of profit high and even growing. But this can only be said if he ignores the amount of fixed capital advanced relative to living labour – information actually present in many official national accounts (fixed capital series compared to gross domestic product or wage bill series). As advanced capital, constant and variable circulating capital becomes of an increasingly negligible magnitude relative to fixed constant capital, due to the increase in turnover speed. So the rate of profit on fixed capital, given the continued impulse to technological change and mechanisation, is increasingly convergent and related to the annual rate of profit. The increase in turnover speed of circulating capital is a countervailing force, but its incidence and relevance is not what Bough suggests. Fixed capital in the Netherlands in 2005 was 93.3% and Japan 92.6% of the total capital advanced, while in 1965 their share was 86.5% and 66.7% respectively (in my estimates annual turnovers were approximately 12 in 2005 and 5 in 1965). This trend is always the same because the turnover speed will increase with the development of productive forces. Obviously from the point of view of distribution, the magnitude of variable capital still remains critical for the amount of surplus value. I have based my estimate on the reproductive fixed capital series of the UK’s Office for National Statistics and the distribution shares on Piketty’s data applied to the ONS official series for gross domestic product. RoP-F is the rate of profit on fixed capital at current prices (in concrete reality capitalists are governed by current market prices, so the rate of profit has to be estimated at current prices). RoP-FR is the rate of profit on fixed capital at constant prices: ie, deflated by the relative price of investment to output prices. In this case what we get is a rate in real terms, which shows the relative evolution of the volume of the profits to the volume of fixed capital. The average rate of profit on fixed capital (RoP-F) in 1990-2009 was 79.2% lower than the average of 1855-74 (falling from 29.9% to 6.3%), while in the case of the real rate of return on fixed capital (RoP-FR), the averages were 39.8% in 1855-74 and 5.7% in 1990-2009, a 84.9% reduction. The difference in the rate of reduction (79.2% vs 84.9%) reflects the countervailing effect of the relative cheapening of constant capital expressed in the slower rate of all at current prices. This cheapening reduces not only the denominator of the rate of profit, but also expands the numerator by reducing the amount of the consumption of fixed capital, or depreciation, therefore increasing net profits. Thus variable capital (VC) is equal to the annual wage bill (W), divided by annual turnovers (N); and constant circulating capital (CCC) is equal to inputs or intermediate consumption (IC), divided by annual turnovers. Then we get a rate of profit on total advanced capital adjusted (RoP-N, or P/K+CCC+VC) or unadjusted by turnover (RoP1, or P/K+IC+W). In the case of the rate of profit on total capital unadjusted (RoP1), the fall in the rate of profit was 77.5% (14.6% to 3.2%), while the adjusted rate (RoP-N) fell less, but was still down 67.2% (17.4% to 5.7%). Again, the difference between the two falls (67.2% vs 77.5%) shows the countervailing effect (and only partially countervailing) of the increase in the turnover speed of circulating capital. The ‘current’ rate of profit in capitalist reality, RoP-N, is expressing the two countervailing factors already mentioned (the cheapening of constant capital and the increase in turnover speed). RoP1R shows the rate of profit on capital advanced without turnover adjustment and at constant prices. Its average in 1855-74 was 16.9% and 3.0% in 1990-2009, showing a reduction of 86.8%, the largest fall in all the measures. So the two major countervailing forces explain the difference in the rate of decline between the two measures (67.2% vs 86.8%). However, RoP-N still declined sharply by 67.2%. 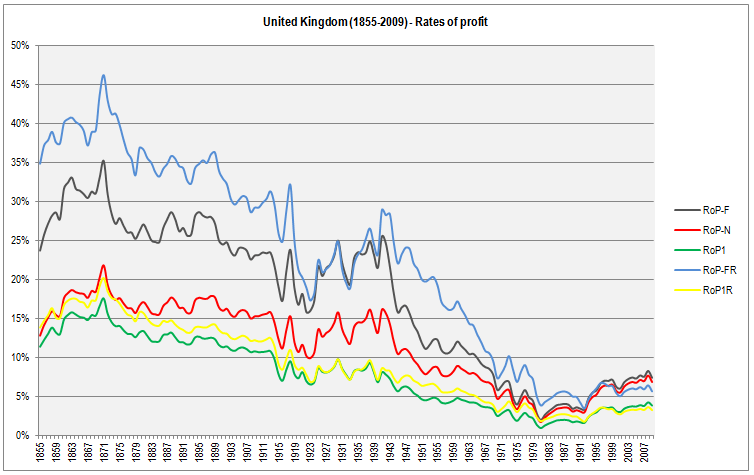 With some differences, all the rates of profit moved in a similar way, showing a clear downward trend in the long run. The isolation of some of the countervailing factors allows us to appreciate that, without them, the reduction would have been even more acute. Fig 1 shows also the convergence over the long term between the rate of profit adjusted by turnover (RoP-N) and the rate of profit on fixed capital (RoP-F) due to the relative reduction of circulating capital advanced. Since the turnover speed was lower historically, initially the rate of profit adjusted (RoP-N) was closer to the unadjusted rate (RoP1). In the next diagram (Fig 2) we can see the relation between the development of the tendency of the rate of profit to fall and the higher relative growth of constant capital compared to the labour force – the only source of surplus value. For simplicity, I present the rate of accumulation in real or volume terms (AC or growth rate of fixed capital relative to the fixed capital of the current year), at constant prices. At current prices, this rate was clearly negative after the crisis of 1871-73 and in the interwar period – in both cases reflecting a sharp devaluation of capital. By contrast, in the 1970s its growth was even higher, reaching a maximum of 21.5% in 1975, given high inflation levels, and exceeding the peak reached in World War I. But, beyond these peculiarities, the accumulation rate in real terms allows us to compare more clearly the relative evolution of the mass of fixed capital to the mass of the labour force. Over this long period, 1855 to 2009, two opposing trends, mediated by the interwar period, have developed, expressing the Marxian determinations explained above. The rate of accumulation reached higher levels in the post-war period (average: 3.8% per year in 1946-2009) compared to the pre-World War I period (average: 2.0% per year in 1856-1913). During these same periods, the growth in the number of employees showed the reverse, with a higher relative growth in the first part (1.3% per year) compared to post-World War II decades (0.3%). During the interwar period, in which the rate of profit recovered significantly, the accumulation rate expanded at an average annual rate of 0.5% – less than the average increase of 0.9% of the workforce. Additionally, the sharp devaluation of capital in the interwar period mentioned earlier led to an increase in the rate of profit. Violent devaluations during crises are both a product of the crises and one of the ways in which capital restores the conditions for overcoming them. The value of fixed capital at current prices fell from £8,638 million in 1920 to £4,625 million in 1934 (a devaluation of 46.4%, which was not recovered until 1943). The movement of the rate of profit tends to follow the relative growth of constant capital and labour. When the latter increases at a higher rate compared to fixed capital, the rate of profit shows some restoration, and vice versa. And, since the increase of constant capital tends to be higher than that of the labour force over the long run, as Marx stated, the obvious consequence is the downward trend in the rate of profit. The development of the productive power of labour and accumulation also implies that a relative higher rate of accumulation is required for the same rate of increase in the labour force. The partial recovery of the rate of profit observed since 1982 has been further supported by an increase in the rate of surplus value and a huge cheapening of constant capital (relative price of investment). Thus the reduction of wages and consumption of fixed capital shares in output implied that the share of profits showed a steady increase, only comparable with that observed between 1855 and 1871. During this partial recovery there have been changes in the contributions of particular industries to the mass of profits and fixed capital of the total economy: eg, the decline in manufacturing and increased contribution from other less mature industries like telecommunication services. The accumulation rate tends to change over the short-term cycle following changes in the rate of profit over the short term. Once the rate of profit reaches a peak in a cycle and begins to decline, the rate of accumulation may keep growing or remain at high levels for some time. This may indicate that with a change in overall profitability capitalists increase investments under the pressure of competition, until the continuation in the fall in the rate of profit finally ends up affecting the accumulation rate. However, when profitability begins to increase after the slump, the accumulation rate takes time to reflect that increase, probably because in such situations there is still much idle capacity. 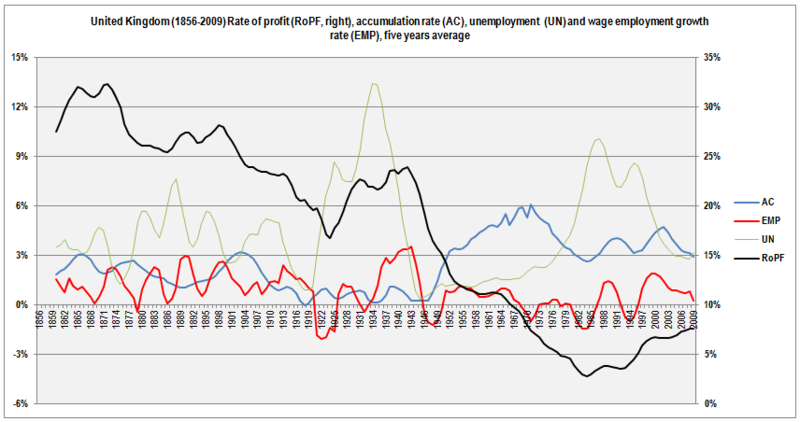 The increase in the unemployment rate is strongly (inversely) related to the rate of profit achieved by capitalists. As shown in Fig 2, with a fall in the rate of profit, the relative overpopulation of labour (the industrial reserve army) increases. But this relation is mediated by the accumulation rate. As the rate of accumulation increases within each cycle, the unemployment rate is reduced. However, in the rising part of the cycle of the accumulation rate, and before reaching its peak, the pace of employment growth begins to fall, while the investment effort imposed by competition through mechanisation intensifies. Once the falling rate of profit is consolidated, the accumulation rate reacts by entering a downward phase, in which net job losses increase the unemployment rate, thus expanding the relative overpopulation as a countervailing force. Traditionally, economic cycles have been detached analytically from any long-term trend, as a succession of rising and falling waves between one horizontal and straight line. However, there is a clear relation: long-term trends develop through a series of cycles. In this sense, any analysis of the cyclical crises must refer to the long-term trends of accumulation and profitability, without neglecting the particularities of every crisis that confer its specificity. To affirm the existence of the tendency of the rate of profit to fall in no way implies the existence of a ‘permanent crisis’ or that the rate of profit falls always. That crises may be preceded by a period of growth in the rate of profit does not deny the validity of the tendency. Nor does any increase in output necessarily imply a growth in the rate of profit. The post-war decades showed high economic growth in most economies, but over that particular period the rate of profit declined steadily, mainly due to the very basic reason that the share of investment in GDP increased more than GDP rose. Recent decades have shown a partial recovery of profitability in conjunction with lower GDP growth rates compared to post-war decades. The tendency of the rate of profit to fall is derived from the contradictions that constitute the mode of production and the commodity itself as a product of social labour under its particular relations of production. Marxist scientific analysis, which differs from all the previous socialist political traditions and all previous forms of bourgeois economics, has clarified that it ultimately expresses something as obvious as it is elemental: capitalism is a historically bounded system. But Marxism says nothing about how or when its final limits will be reached. Today, due to the increasing development of long-term statistics, we are able to make use of better tools that allow us to develop a more accurate analysis of the capitalist economy and its trends. This is one meeting between ‘theory’ and ‘data’ of which the debunkers have not taken note. 1 ‘False premises, false conclusions’, June 19 2014; ‘Not in awe of “experts”’, July 17 2014. 2 ‘Incomprehensible and erroneous’, July 10 2014. 3 ‘Distribution, turnover speed and profit rate in Chile, Japan, Netherlands and United States’:http://uba.academia.edu/EstebanMaito. 4 ‘The historical transience of capital’:http://uba.academia.edu/EstebanMaito. 12 ‘Distribution, turnover speed and profit rate in Chile, Japan, Netherlands and United States’:http://uba.academia.edu/EstebanMaito.